MOBROG Review - Is MOBROG a Scam? Is MOBROG survey legit? Does it really worth your time? 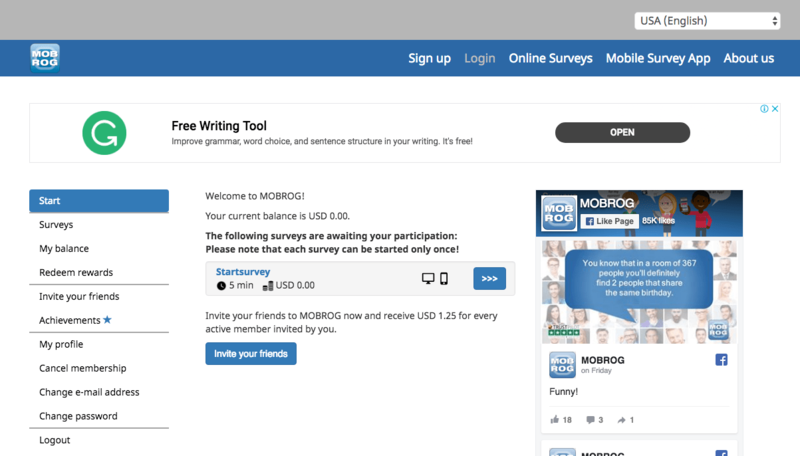 In this review, I will take a look at MOBROG and its online reviews. If you are one of the people who want to know the end of the story fast, click here and read the 30-second summary of MOBROG review. It is a paid survey site which lets you earn money by participating in online surveys and mobile surveys. This website is owned by SPLENDID RESEARCH GmbH, which is a German market research company and it is available for people living in most countries. You can earn on average something between $0.5 to $3 for every survey and you can cash out via Paypal or Skrill once you have earned at least $6.25. You can also earn money by referring your friends. Each active friend will earn you $1.25. Active referred to people who have completed at least 3 surveys. Registration is very simple and it only requires your basic information. However, you need to provide more information later in order to be eligible to take surveys. When you log in to your account, you will see a very simple dashboard full of ads. As you can see, you need to complete a starting survey before you can take the real surveys for money. It takes around 5 minutes to complete it and you will get no reward for completing it. As I am writing this review, there are still no available surveys in my account. In general, the number of surveys you can find depends on your profile, location, etc. So, maybe my profile is not very exciting for survey takers. As you can see, it just tracks your MOBROG achievements in order to motivate you. There is nothing special here. The last notable thing in the member’s panel is that they show lots of ads in the member’s panel. Apparently, their main source of income is advertising. The website has been online for many years and it is paying without any major problem so far. However, you should be careful with this site. 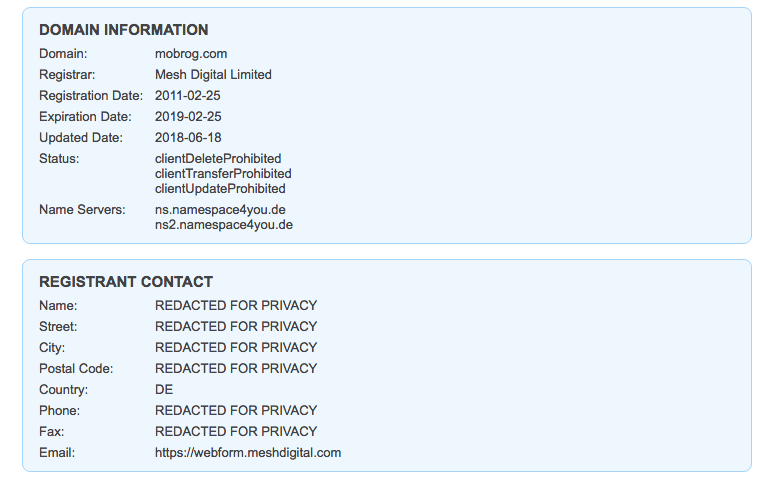 If you take a look at the Whois info, you will find that the domain owner information is hidden. This is not professional for a website which is owned by an official company. Usually, reliable companies submit their real information as the domain owner. They have a total number of 12 reviews with an average rating of 3.2 out of 5 on SurveyPolice. Here you can see three of the most recent reviews. Things are a bit different on TrustPilot. You can find more than 14500 reviews on TrustPilot with an average rating of 9 out of 10 which is really high, unlike SurveyPolice rating. But, what is a little odd for me is that most reviews here are very short and they don’t have specific details. As you can see the content of the reviews are very cliche and general. The quality of them is so low that you cannot easily trust them. All in all, MOBROG is not the best survey site in the world. The functionality of the website is very basic and they have very few surveys to offer. If you are interested in online surveys, there are much better websites you can use. Swagbucks is one of the most popular survey sites. Unlike MOBROG, it offers you a variety of ways to earn extra cash online like: Watching videos, Searching, etc. With a clean design and relatively high-paying surveys, this one also worth checking out. It is also a fast-growing website and their traffic is increasing day by day. Read the complete review of SurveyJunkie. To conclude, MOBROG is not a scam but it does not worth your time. If you like to take part in online surveys, check out the more popular alternatives. As you may probably know, taking online surveys can never become a main source of income. It is just a way to earn a few bucks online. I think doing online surveys is a waste of time because the earning potential is very low and you will eventually become tired of doing it. You can put the same amount of time into something more valuable and more serious and create a passive income. The wisest way to spend your time online is to create something once and get paid for the rest of your life. You can take a look at our #1 recommendation to learn more. As always, if you have any questions or comments, just shoot it down here and I will happily respond as soon as possible. HI Ash, thanks for your post. I have not joined this particular site but have others previously. Most seem to operate the same as this one and the two I was a member of did pay out when they said they would and for the surveys that were done. One paid out in gift cards to a store of my choice – there was a list – and the other in cash once a threshold of about $50 was reached. I stopped doing them however for the same reasons you have outlined.. they took a LOT of time. I would say that to get one $20 gift card took about 20 hours of surveys.. just really not worth my time. plus some of the surveys were so long that they got really really boring after a while. In my opinion, they are maybe worth it if you wanted to make a little bit of $$ and had plenty of time but I agree with Ash that there are waaayyy better ways to make more money online for the same amount of effort – remember nothing on the internet makes you a lot of money for no work. I absolutely agree with your final line, Paul. In order to see great results, you have to put time and effort in the right direction and work hard towards adding value. I will be honest: I have mixed feelings about survey websites. While I don’t disagree that you can make money with surveys (or with MOBROG site in this case), personally I had negative experiences with survey sites. They make things so complicated! You spend a few mins answering pre-test questions only to find out that I’m not eligible (for majority surveys apparently) or there are some payout issues. Except Swagbucks which is an amazing platform but the thing is that SB isn’t a surgery site only, it has a variety of options… My preferred way to make money with it is through referrals and web browsing. Given that I always do research online, it’s probably the best way for me to make extra cash with no extra energy on my part. In any case, I decided that it’s best to focus on big wins. That is, to focus on legit ways to make money through my blogging and Amazon affiliate program. Swagbucks is a decent website which lets you earn a little extra cash but the earning opportunity is still very limited. With blogging and affiliate marketing it takes more time to see any result but the ultimate outcome worth it. Just focus on adding value and you will nail it Zarina. I don’t really mind survey sites at all, and at least this one offers paypal as a cashout option (which is always a good sign). I actually used to use these survey sites to earn extra cash several years ago. The only grind I used to have with them is the sneaky tactic they use to screen you out after you’ve answered about ten questions. It always seems so unfair that they get the answers and you get no reward whatsoever for 10 minutes of your time. Did you ever use these sorts of sites to earn a little extra cash? Thanks for sharing your experience, Chris. I personally am not a fan of survey sites. I think some are better than others yet all of them will ultimately waste your time. Never herd of this site before, very good review and information on doing survey’s online. I agree that the amount of time it takes to complete a survey is not worth the money they pay you for doing it. The way you pointed out that there are very few high reward oppertunities in this field makes it that much more a turn off. It sure does not worth your time if you are looking for a new income stream. I am happy that it is legitimate but just like you said I don’t recommend it to people who really want to earn money online. I have always considered that online surveys are some type of scam but it can be some sort of an extra cash. Great review! It is good to know that there is some legitimate surveys online. There are some legitimate survey sites online which are decent you let you know earn some extra cash online. But the opportunity is limited with surveys.